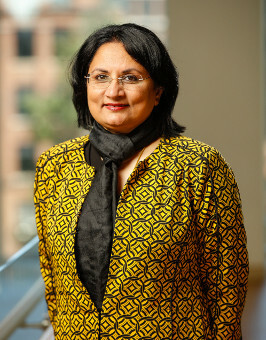 Sandhya Seshadri is a researcher, educator, and clinician who is the Project Director for the ENGOAL (Engaging Older Adult Learners as Health Researchers) project. Her research focuses on the health of community-dwelling older adults. As a qualitative researcher, Seshadri has worked on several studies including an inter-professional longitudinal study examining older adults' transition from the Emergency Department to their homes. She has presented her work at local, national, and international conferences. As an educator she teaches students qualitative research methods and the clinical management of swallowing disorders, Aphasia, and motor-speech disorders. She also supervises the clinical practicum of graduate students at the York Wellness and Rehabilitation Institute at Nazareth College, Rochester and teaches them clinical skills related to the diagnosis and management of communication disorders stemming from neurologic etiologies. Seshadri practices at Strong Memorial Hospital and is a licensed speech-language pathologist with 20 years of clinical experience specializing in diagnosing and treating adults with neurogenic communication and swallowing disorders. She is a member of the American Speech Language and Hearing Association. Duckles, J. M., Sellers, C. R., & Seshadri, S.
Finta, M.K, Borkenhagen,A., Werner, N., Duckles, J., Sellers, C.R., Seshadri, S., Lampo, D., & Shah, M.N. Werner, N. E., Borkenhagen, A., Finta, M.K., Duckles, J., Sellers, C.R., Seshadri, S., Campo, D., & Shah, M.N. Seshadri, S. & Sellers, C.R. Brown, B, Coles, H., & Seshadri, S.
Duckles, J., Seshadri, S., Sellers, C.R., Lampo, D., & Shah, M.N. “My Choice was Breathe or Eat”: Understanding the Choices made by Community-dwelling Older Adults with Dysphagia. Seshadri, S., Sellers, C.R., Kearney, M. H., & Szekeres, S.
Seshadri, S., Eichinger, K, & Flannery, M.
Sellers, C. R., Duckles, J. M., Shah, M. N., Seshadri, S., & Lampo, D.
"What Makes for “Successful” Transitions from the Emergency Department to Home among Community-dwelling Older Adults? Sellers, C. R., Duckles, J. M., Shah, M. N., Seshadri, S., Salerno, S., Elliot, A., Christensen, T., & Lampo, D.
Brown, B., Callari, S., Durant-Jones, L, Hyland, M., Seshadri, S. & Zumbo, J.
Chirico, J., Durant-Jones, L., Orcutt, K., & Seshadri, S.
Seshadri, S. (2017). Assessment, Management, and Rehabilitation of Dysphagia in Older Adults. Geriatric Rehabilitation: Bedside to Curbside (1st Edition, Ch. 15). Boca Raton, FL: CRC Press. Duckles, J., Seshadri, S., Lampo, D., Sellers, C. R., & Shah, M. N. (2014). “It’s a balancing act”: Understanding relational strategies of community-dwelling older adults navigating post-emergency care and health in the context of everyday life. [Abstract - Oral]. International Journal of Qualitative Methods, 13, 506-507. Sellers, C. R., Duckles, J. M., Shah, M. N., Seshadri, S., Salerno, S., Eliot, A., & Christianson, T. (2013). What makes for 'successful' transitions from the Emergency Department to home and community among older adults? [Abstract - Oral]. International Journal of Qualitative Methods, 12, 815-816.